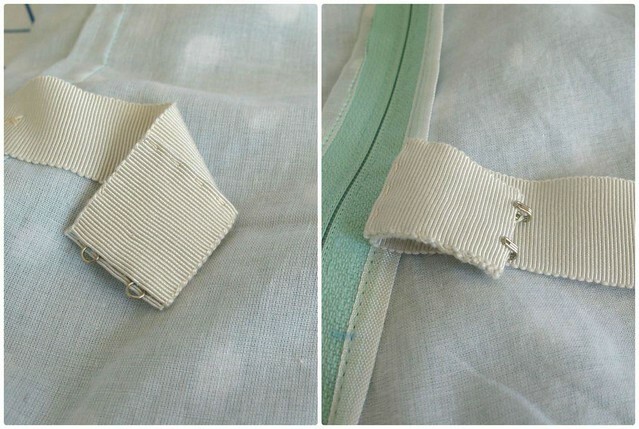 Today I thought I would share a great way to take your garment sewing to the next level with a grosgrain waist stay. 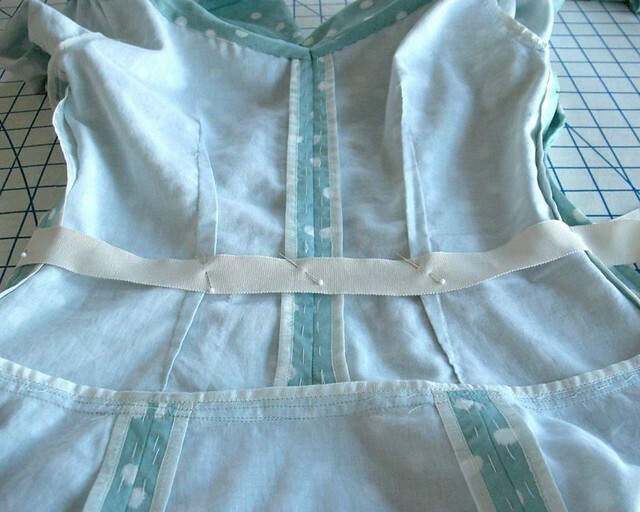 A waist stay relieves tension on a garment at its tightest point and helps to support the weight of the fabric. 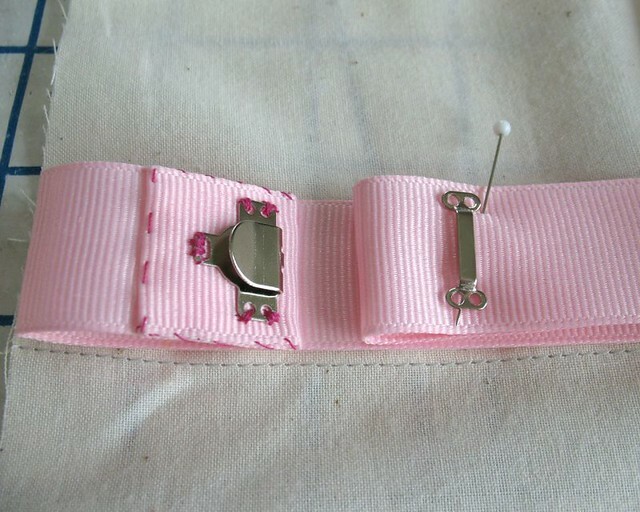 It also keeps seams and zippers from being strained during wear. As an added bonus, it can serve as an extra pair of hands when trying to zip/snap/hook/button yourself into the garment! And if you are a fan of strapless garments, a waist stay is invaluable. These days many clothing manufacturers use a rubberized strip at the upper edge to keep a dress in place - having developed a rash from wearing one for a few hours, I refuse to go that route. Stabilizing the dress from the waist or under the bust is so much more comfortable and secure! 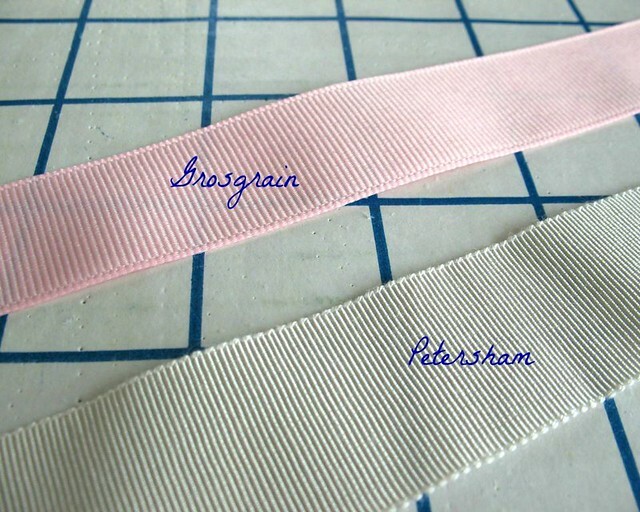 There are two types of grosgrain ribbon that make an excellent stay. Grosgrain commonly found in craft stores is made from polyester and has a bound edge that has absolutely no give. That kind of strength is excellent for a waist stay, but those edges can start to feel uncomfortable after many hours of continuous wear depending on your tolerance of tight clothing. I recommend using ribbon that is 1” or 1.5” wide. 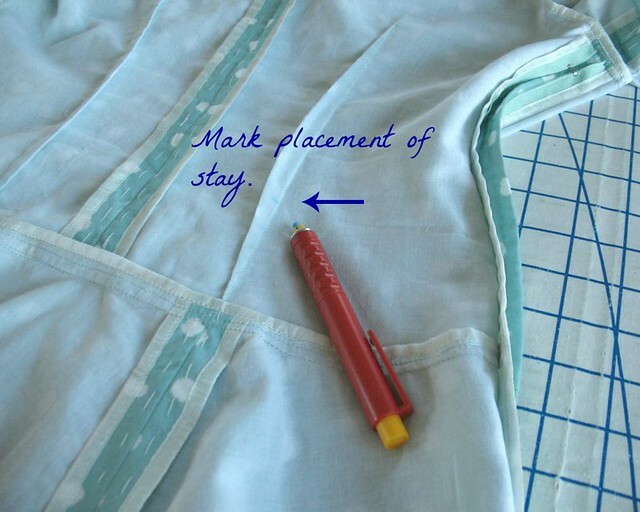 If a 2” wide ribbon is used at the waistline, small darts may be used to shape the stay. 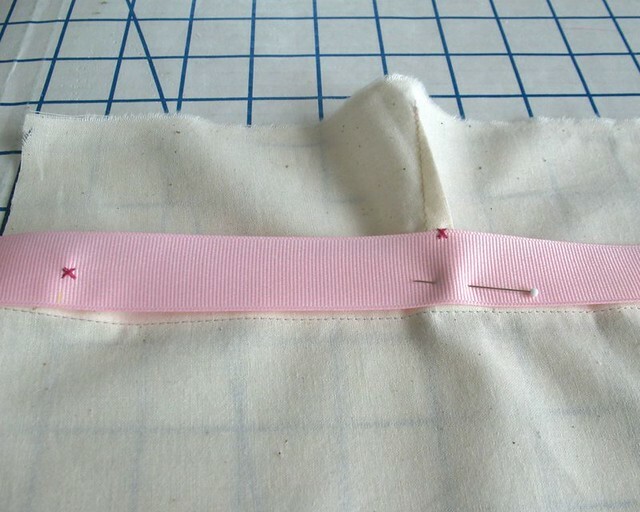 Starting at one opening edge, leave two or three inches of grosgrain as a tail and pin in place. 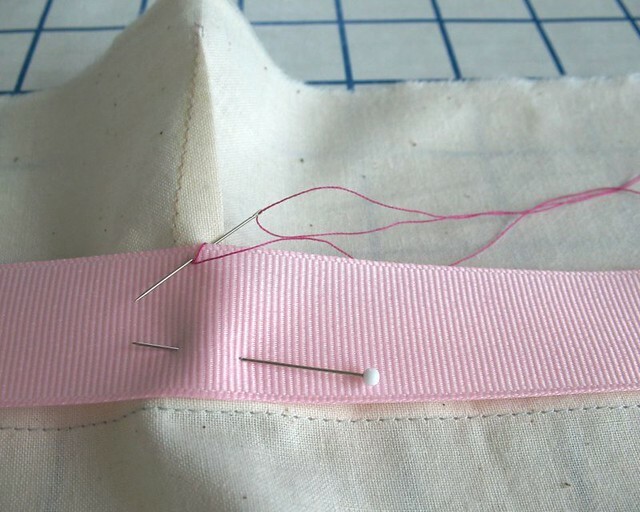 Lay the grosgrain flat against the garment until you come to the first stitching point. 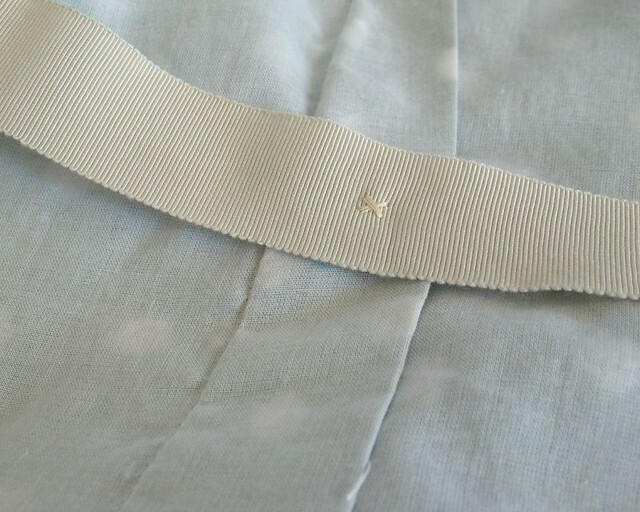 Pull the stay slightly past that point so that the grosgrain is shorter in length than the garment fabric and pin into place. This will cause a bit of puckering when laid flat, but this is what you want. 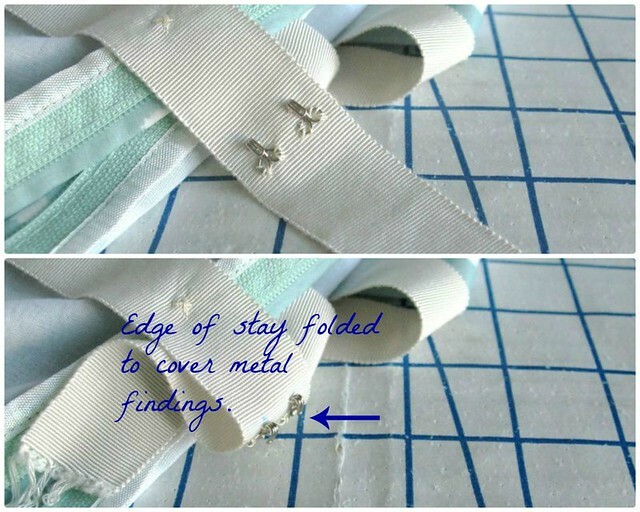 Continue this process until you reach the opposite opening edge, securing the ribbon with a pin at each seamline and dart it crosses. The stay should measure slightly smaller in circumference than the waistline it stabilizes. Think of two concentric circles – the inside circle circumference must be smaller than the outer one in order to fit inside. You may carefully measure your stay and divide up the ease between each attachment point (generally darts, tucks, or a seam allowance), but I usually just wing it. 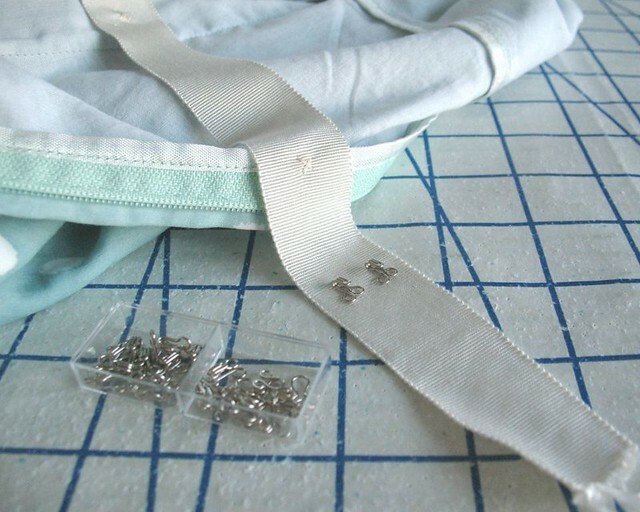 Using a reinforced cross-stitch, attach the stay to the garment at each pin, making sure to only catch the seam allowance or dart so that none of the stitches will show from the right side of the garment. 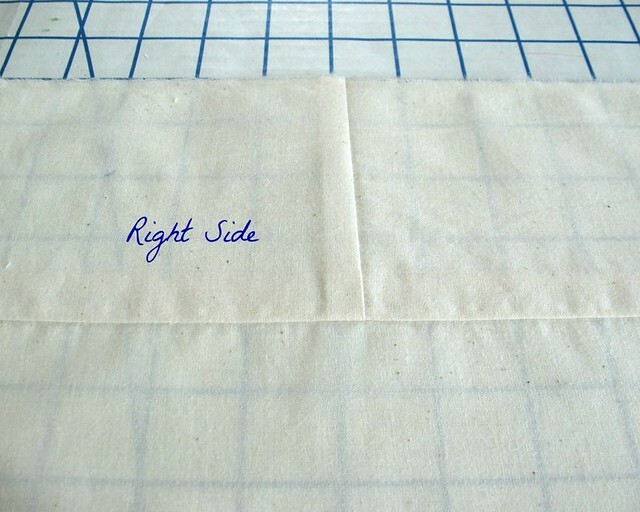 Cross-stitches may be stitched through the middle of the stay, or at both edges. 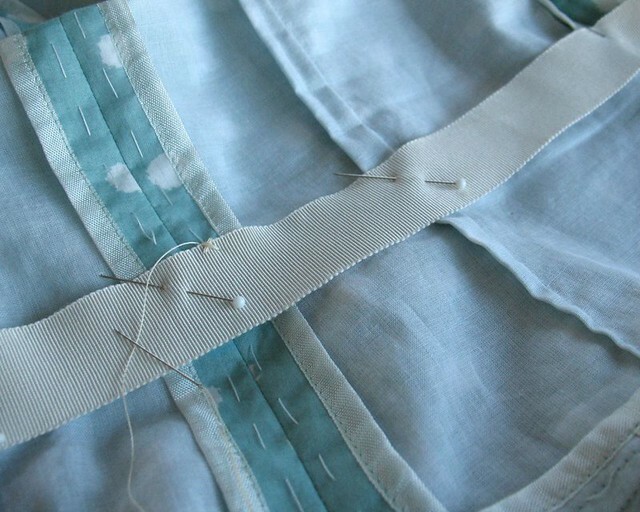 I often use a combination of both options, depending on how my garment is constructed, how many intersecting seamlines and darts/tucks are available to secure the ribbon, and the width of the grosgrain ribbon. 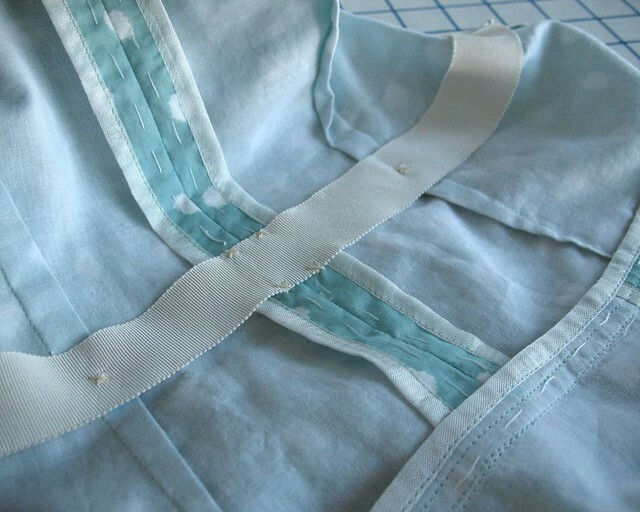 This particular dress has a dropped-waist, but the technique is the same for a garment without an appropriately placed seamline such as a princess seamed dress. For such a garment, make sure to mark your waistline on the wrong side to ensure proper placement. A stay may also be inserted just under the bustline, as is the case with this dress. The idea is that the stay is carrying some of the weight of the garment so that it no longer hangs from the shoulders and/or upper edge and is secured on the torso. This will also help to keep the garment from rotating on the body during wear. The easiest way to close the stay is with a hook & bar closure. Make sure to stitch the hook so it faces away from your body with the ribbon creating a barrier between your skin and the metal. Using smaller hook & eyes is a bit more time consuming, but look so pretty! The ends of the ribbon may be used to cover most of the metal bits. I like to off-set the opening of the waist stay slightly from the zipper so the zipper teeth and metal hooks are not layered one on top of the other. 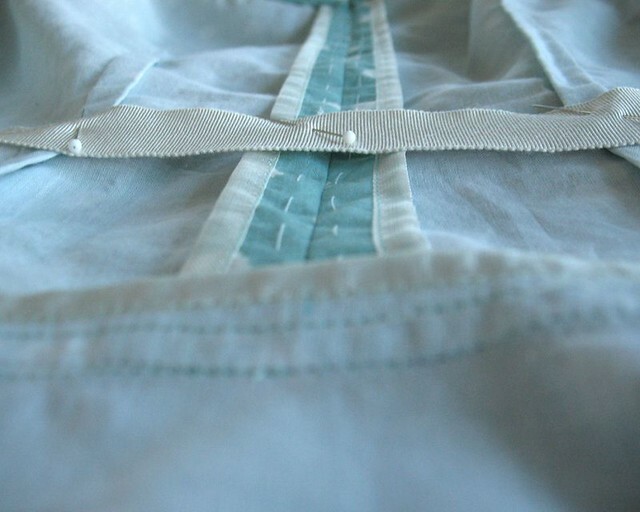 Technically, a waist stay must be somewhat independent from the garment and not stitched continuously to a seam allowance. However, every garment may not require a true waist stay, and there are more basic options that will help to stabilize a horizontal seamline. 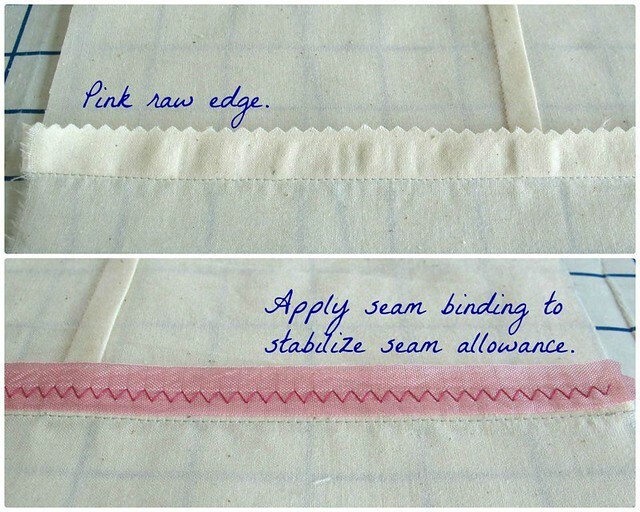 One such option is to use a length of seam binding or twill tape. 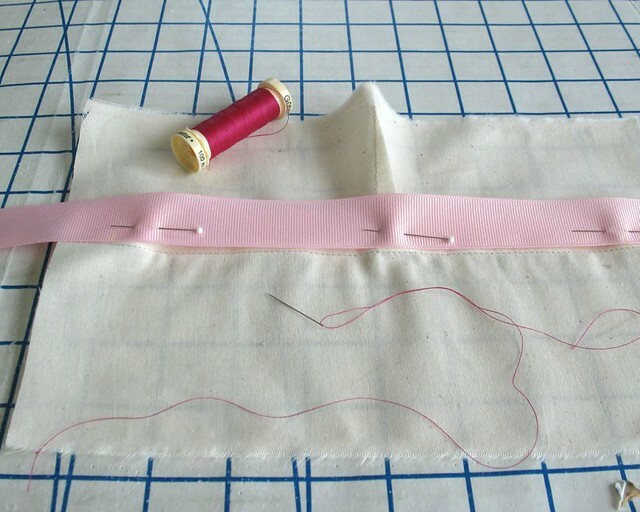 This is not as structured as a true waist stay, but a quick pinking of the raw fabric edges and the addition of the straight of grain binding keeps any cross seams from pulling apart, adds stability, and helps to eliminate cross grain stretch at that seam. 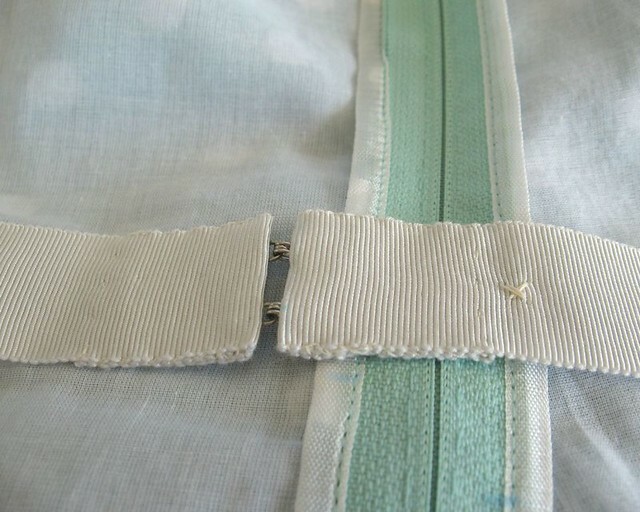 A length of narrow grosgrain may also be used in this manner. 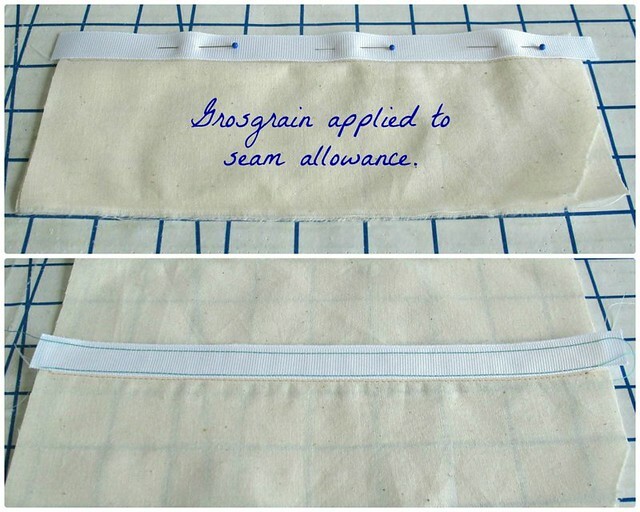 I would not, however, use this technique with an invisible zipper because of the increased bulk the grosgrain adds in the zipper seamline. 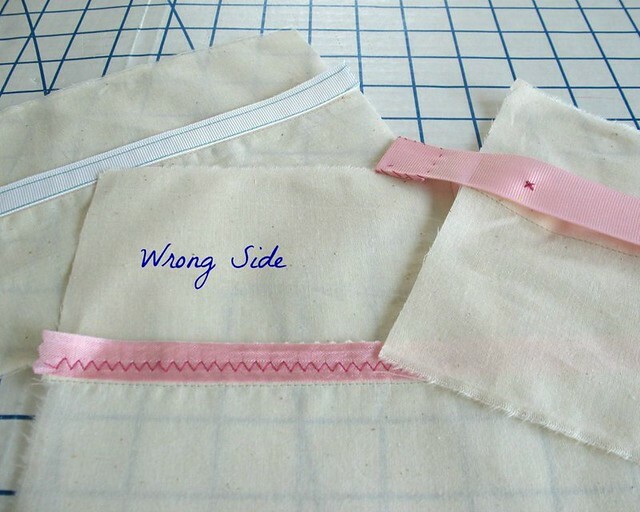 You could, however, terminate the stitching lines on the grosgrain an inch or so from the opening and use a hook & eye closure as explained above. Whichever method you choose, a waist stay is an excellent addition to a garment that will help to increase the life span of your garments. 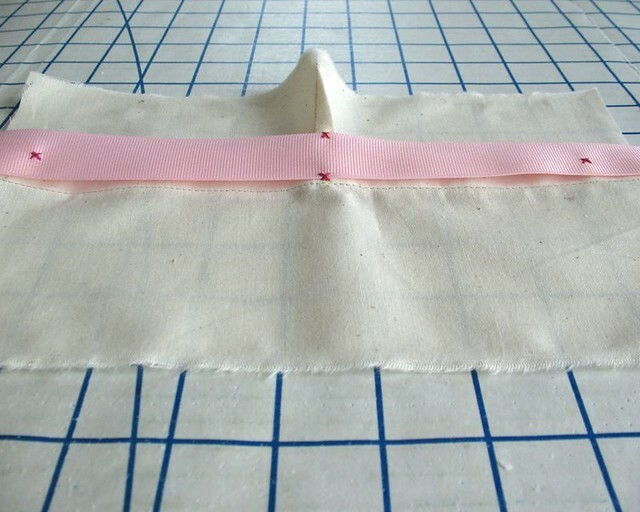 I highly recommend adding this technique to your sewing arsenal! Laura Mae I learn such a lot from you! Thank you. I will definitely try this. Wonderful instructions! I have not applied waist stays to dresses but I will now. Thank you. Very clear and precise - thank you! Your tutorials are the best! this is seriously awesome, thank you so much! Thanks for taking the time to post this tutorial. Such a great resource and appreciate clear pictures! Wonderful. Thank you. I just adore seeing your techniques. A very informative tutorial. Thank you so much for the time you invested in this post. I love that you do actual hand sewing! So many garments made nowadays need it and sewists seem to not want to learn how. Machine sewn straight hems that are visible on the public side just don't sit well with me. I know this, I do this,but it's so wonderful to aspire to better work. I never tire of seeing your garments inside out and your photography of them. Thank you, it's so pretty! I'm in awe of your hongkong finish and your handbasting...then you pull out the waistband stay and I swoon. Thank you for your inspirational post. I've just made a vintage 1953 dress with a slightly dropped waist which required a waist stay, but of course these patterns, even the remastered ones don't explain in detail how to do it. So thank you this has been invaluable and I can now complete my project properly. This is such a fabulous tutorial. Are waist stays exclusive to dresses, or should they be used in skirts as well? Great tut! Clear pictures and very detailled. One question though : What do you suggest regarding measurements of the ribbon? I guess smaller than the actual waistsize? But how tight? 1" less than the natural waist measurements? 2"? I think it has to be tight. Especially when using inside a corseted evening dress (all in very heavy sequin fabric) What would be you advice? Thanx! Yes, the waist stay should be slightly smaller than waist measurement of the garment! It depends on the garment, but I generally go about 1" to 1.5" less - too much more than that and you may start to see some puckers from the outside of the garment. But it should definitely be snug on the waist so it helps to support the weight of the garment. If the garment waistline is more than 2" larger than the person's waist, you may want to alter the garment before inserting a stay. I just followed your tutorial to insert a waist stay into a dress I will be wearing to a wedding on Saturday. Your instructions and photos were very helpful. Thank you! Thank you for the really helpful tutorial and for everything you post, your work is so precise and professional, it’s inspiring ... and a little intimidating! I was thinking of a waist stay for a waisted coat, but then there’s the problem of the coat’s front facing, which means it couldn’t be hidden. Do you ever use waist stays on coats? Is it worth doing one that doesn’t actually attach around the waist but just runs from each front facing seam to add support to seams and darts?